Pierre’s first wife, Angélina Meunier, died in July 1896, leaving behind seven children, including my grandfather (Pépère) Fred, who was only six years old. A year later, Pierre married Mathilde Cloutier, who was born and raised in Ste-Cécile-de-Masham, Pontiac County, Quebec, like Pierre and his family. They had five children: two sons and three daughters. Mathilde’s burial record doesn’t indicate the cause of death (such records rarely did), but she was 62 years old at her death. Her husband was present at the funeral on 18 April, along with their son Joseph, my grandfather’s eldest half-brother. I don’t know what kind of relationship Fred had with his stepmother. I wish I had thought of asking him when he was older after I got interested in genealogy. Ce dix-huit avril mil neuf cent vingt-trois / je soussigné curé de cette paroisse ai / inhumé dans notre cimetière le / corps de Mathilde Cloutier, épouse / de Pierre Belair, de cette paroisse / et y décédée avant-hier âgée de / soixante ans. Etaient pré / sents Pierre Belair, Joseph Belair et autres parents et amis qui ne / revinrent pas après le service. 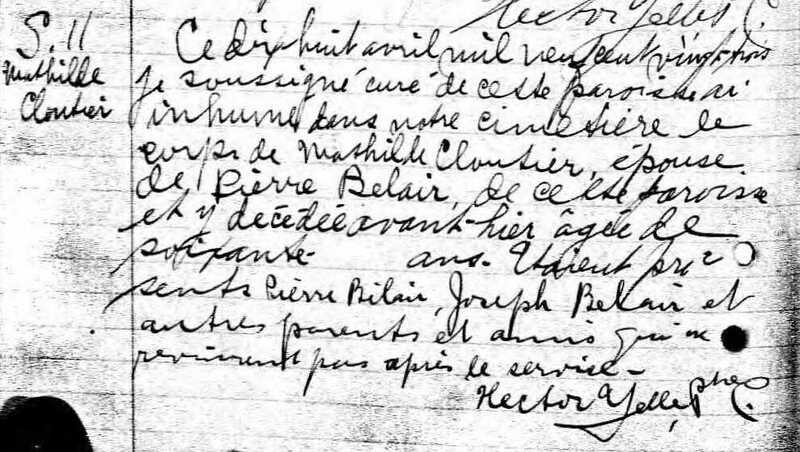 This 18 April nineteen hundred and twenty-three / I undersigned [parish priest] of this parish have / interred in our cemetery the / body of Mathilde Cloutier, wife of Pierre Belair, of this parish / and who died [the day] before yesterday aged of / sixty years. Were pre / sent Pierre Belair, Joseph Belair and other relatives and friends who did not / return [to the church] after the [burial] service. 1. 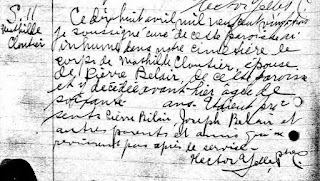 Ste-Cécile (Ste-Cécile-de-Masham, Quebec), parish register, 1918-1930, p. 95 verso, entry no. S.11 (1923), Mathilde Cloutier burial, 18 April 1923; Ste-Cécile-de-Masham parish; digital images, “Quebec Vital and Church Records (Drouin Collection), 1621-1967”, Ancestry (http://www.ancestry.ca : accessed 30 March 2018).